The arguments between the bulls and the bears in the current market has one interesting twist: both are shaving off pieces of the economy and ignoring the rest. The bears for focusing on housing and capital spending while ignoring the employment and wage situation. In contrast the bulls are focusing on employment and wage gains without taking full stock of the housing problems -- or in the least arguing that housing won't spill over because it hasn't yet. However, I think the bulls have a stronger argument for now simply because they are already in control of the market. The markets have rebounded fairly well from the China sell-off and appear to be moving up still. That being said, I think the bulls will remain in control for now, assuming the following happens. 1.) Earnings continue to at least meet expectations. 2.) There is no severely negative employment news. For example, last month the BLS reported a gain of 180,000 with upward revisions to previous months. From the bulls perspective, this news will help to fuel wage gains which will drive consumer spending. 3.) The torrid merger and acquisition pace of the last few months continues. 4.) Consumer spending continues in positive territory. Consumers account for 70% of US GDP growth, so their continued spending is vital to keep the economy from falling into a recession. I have been very negative of consumers, largely because of debt levels. However, we have yet to see a level where consumers don't spend. Until we see that, we need to assume the consumer will continue to buy all sorts of stuff. 5.) News of the subprime mortgage problems remain largely contained in the subprime area. If we start to hear a spate of news about prime mortgage defaults increasing or a large number of banks increasing loan loss reserves, than bulls may get skittish. We have already had some news to this effect in the market, but I don't think it's enough to scare the bulls. Below I express what appears to be the bear's main line of arguments. Here is how the bulls are looking at things. While GDP growth is slowing, the elements causing the slowdown are contained. The housing slowdown had not severely impacted consumer spending. While personal consumption expenditures slowed in the second and third quarter of 2006 to 2.6% and 2.8% respectively, they accelerated to 4.2% in the 4th quarter. The main reason for this increase is solid job growth leading to increased disposable income. According to the Bureau of Labor Statistics the US added 180,000 jobs in March and previous months were revised higher. These gains are adding to confidence and bolstering spending. According to the Bureau of Economic Analysis disposable income increased 1.06% in the 4th quarter. The economy demonstrated it can take the shock of higher oil prices last summer, so the increase in gas prices at the pump won't slow spending this summer. This chart is from a site called Shadow Government Statistics. I can't speak to the veracity of their computations. However, if the chart below is correct -- or even in the ballpark -- we could have an answer for the bull market. I admit it: the current rally is perplexing to me. In an attempt to try and figure out what exactly is going on I'm going to present what I see as the bull and bear market arguments to see which makes the most sense. GDP growth is declining. According to the Bureau of Economic Analysis GDP growth for the last three quarters was 2.6%, 2% and 2.5%. Gross Private Domestic Investment was the primary reason for th decline. Residential investment has dropped 11.1%, 18.7% and 19.8% for the last three quarters. While nonresidential investment was positive for the first two of these three quarters, it declined 3.1% in the fourth quarter of 2006. While personal consumption expenditures have increased, the consumer is heavily indebted. Household debt has increased from 97% of disposable income in 2000 to over 130% in 2006 (this information is from the Federal Reserve's Flow of Funds report). At some point these debt levels will constrain consumer spending, especially with a negative savings rate. While inflation is not out-of-control, it is above the Fed's stated 1%-2% comfort range. Energy and agricultural prices are under upward price pressure which will prevent inflation from coming down. This in turn will keep the Federal Reserve on the sideline if GDP growth continues to slide. Will International Sales Prevent a Bear Market? There are a lot of earnings reports coming out right now, and there seems to be a common theme. The US economy is weak, but international sales are keeping earnings going. Just below this article I posted points from Caterpillar's report that showed a big drop in US sales but strong international growth. While McDonald's saw solid US growth, they also had good numbers from international sales. Europe also delivered strong growth in the first quarter, fueled by robust same-restaurant sales across the segment. Quarterly performance in the Asia/Pacific, Middle East and Africa segment was also strong, as the company cited its "everyday value and locally relevant products driving comparable sales and financial results across the segment." Today, we present two U.S. equity implication of a soft dollar. First, the S&P growth index is mostly comprised of sectors that have sizable international sales exposure. Importantly, a soft currency makes their products cheaper to foreign customers, a positive development for revenue growth. Meanwhile, the opposite is true for companies in the value benchmark, as their client base is primarily in the U.S. The upshot is that analysts will continue raising relative earnings estimates in favor of growth companies in the coming months. Bottom line: diverging global economic expectations and a weak U.S. dollar bode well for growth over value. This article makes a very prescient observation: growing international markets plus a cheaper dollar mean US companies are now experiencing a similar situation as Asian exporters. Will this prevent a bear market? I don't know. But, I am seriously considering the implications of these events. From CBS Marketwatch. This is from a report on Caterpillar's earnings release. "In North America, sales volume was down significantly from a year earlier," a company statement said. The negative aspects of the quarter included a "significant" decline in housing construction, a slowdown in nonresidential construction and a decline in coal production. "The steep drop in housing construction continued to depress sales, particularly of smaller machines, as home contractors retrenched. ...Coal mining had a bad first quarter." North American machinery sales fell by $450 million, or 13%, but rose by $560 million, or 44%, in Europe, Africa and the Middle East. Cat's earnings from outside the US were the reason for the stock's strength today. The news from the US is not that good. What an odd assortment of weekly charts we have. The SPYs and QQQQs had a hard time gaining any traction until today (Friday) -- they basically meandered between bulls and bears with no sense of direction. However today they opened higher and basically kept in that position. The QQQQs sold off a bit, but not so much as to endanger the rally. The IWNs were essentially unchanged for the week, although they had a really big dip yesterday, but got rid of the loss today. None of these are strong bull market charts. They show the market is susceptible to random events for quick movement, but outside of those moves they are essentially evenly balanced between the bulls and bears. Here is a weekly chart from Stockcharts. 1.) The dollar has broken through support and is now trying to find a new low. 2.) 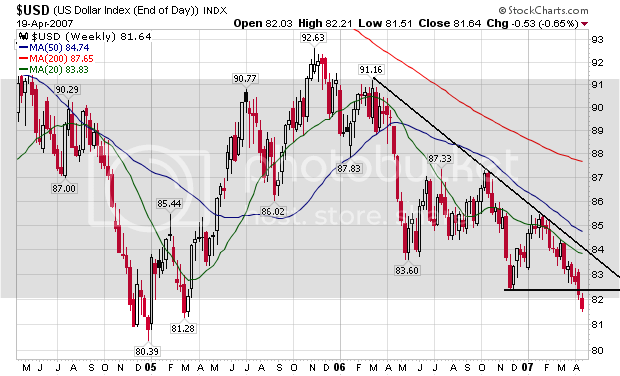 The downtrend started in early 2006 is still intact. 3.) The 20, 50 and 200 day SMAs are all heading lower. In short, there is not one bullish element on this chart. The underlying fundamentals are still bearish. The US economy is slowing while other economies are growing. While the trade deficit has decreased over the last few months, it is still at very high levels. Here's a chart from Stockcharts. 1.) The uptrend started in mid-January is still intact. 2.) The average is still above the support line drawn from mid-December to early March. 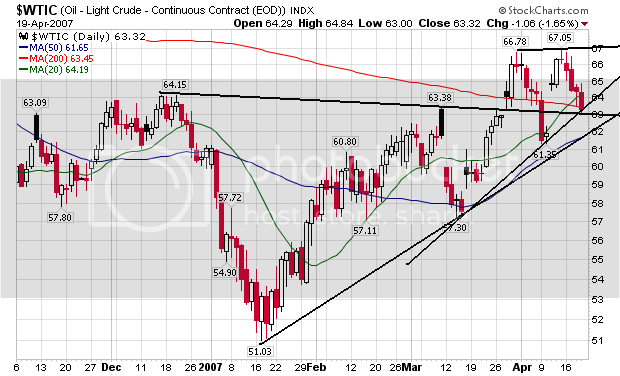 This is the neckline of a head and shoulders pattern. Prices are just above this line right now, so we'll have to see how the average reacts to this line of support. 3.) 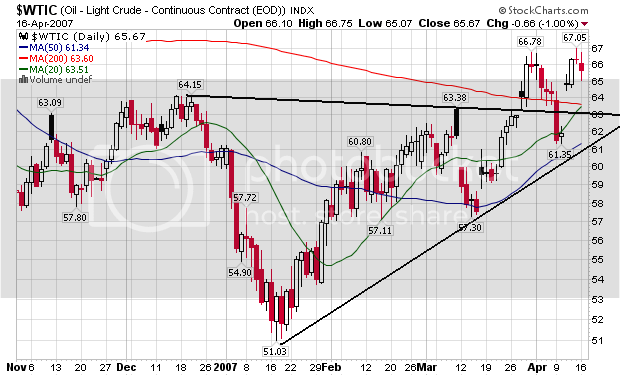 The average has formed an ascending triangle pattern from mid-March to the present. That means we have lower bottoms which is usually a bullish indicator. 4.) The 20 and 50 day SMA are still trending up. The fundamentals are still bullish. Demand is increasing and OPEC has successfully limited production. The US is starting the summer driving season and gas prices are already higher than at the same time last year. New orders were just above 0. Shipments dropped. Here's some bad news for the Fed. Prices paid increased while prices received dropped slightly. The prices received index has dropped for three-straight months. This may indicate producers are having to cut prices to move product. In addition, inventories have increased three straight months, indicating future production may drop to prevent more of an inventory build-up. Area manufacturers reported higher costs for inputs again this month. The prices paid index edged three points higher and has now increased for three consecutive months. Thirty-seven percent of the firms reported higher input prices, up seven points from March; 13 percent reported lower input prices in April. Despite increased costs, fewer firms reported higher prices for their own goods this month: 17 percent reported higher prices, down nine points from March. The prices received index fell 11 points, to 5.2, its lowest reading since August 2005. These two reports indicate the decline in Capex spending may be hitting home with manufacturers. In addition, manufacturers are just hanging on in positive/expansion territory. Below are three charts for the Utilities, Healthcare and Consumer Staples ETFs. The charts are for the price performance year to date. Notice how they have all done well this year. Is this the beginning of a flight to safety? It sure looks like it. D.R. Horton Inc. (NYSE:DHI - News), the largest U.S. home builder, said on Thursday quarterly earnings fell 85 percent, in part due to charges related to the lower value of land. For the fiscal second quarter that ended March 31, D.R. Horton earned $51.7 million, or 16 cents per share, down from $352.8 million, or $1.11 per share, a year earlier. The results included charges totaling $81.2 million, or 16 cents per share for land options forfeited and for the lower value of inventory of land and houses it owns. "We believe that there will be continued softness in '08, and I would expect that we'll continue to adjust our inventories downward in the first two quarters of '08," Tomnitz said. About 80 percent of the impairment charges were related to California projects, particularly in Sacramento. Horton, based in Fort Worth Texas, said it has begun to aggressively cut prices in California. Excluding the charges, the earnings were 32 cents per share, short of the 36 cents that was the average of analysts' forecasts, according to Reuters Estimates. A 7 percent reduction in the average selling price of a home and added incentives hurt gross margins before the charges. The margins fell to 17.7 percent, down 7.8 percentage points from the previous year and 0.9 percentage points from the prior quarter. There is nothing good in this report. 1.) Notice that land values are dropping. 2.) The company is "aggressively cutting prices." That will hurt profits and margins going forward. 3.) The company is using incentives aggressively. This hurts in several ways: it further hits profits and margins and it means home prices are in fact lower than stated. 4.) The company is now saying 2008 will be soft. That means housing problems will be with us for longer than we would like. The following is from the comments section and frankly needs no further explanation. The weekly data has to be treated as noise, there is too much variability in volume in this weighted index. The months’ sales and traffic tell a more interesting story. First, notice how each successive month is increasing less over last year’s numbers. In the case of March, adjusted for inflation, there was no growth YoY. Second, notice how the YoY sales increases have been built on less traffic. This is a pretty startling statistic, in that it suggests that the “median” consumer has rolled over, but the “mean”, more wealthy consumer has enough wealth to casue the overall result to stay positive. March’s positive foot traffic may be due to Easter coming one week earlier this year. By the end of April, we should know if the trend is intact. If the trend continues, we should have negative YoY retail sales no later than summer. (BTW, I haven't found Shoppertrak's earlier 2006 data anywhere online. I'd be glad to take the series back further, if someone can supply a source). Home foreclosures rose 7% in March to 149,150, RealtyTrac said. The figure, which includes default notices, auction sale notices and bank repossessions, was up 47% vs. a year ago. It comes as the gov't urges lenders to try to rework troubled subprime loans. Also, mortgage applications fell 2.5% last week as rates rose again. Rates have retreated this week. I will continue to make this observation: we are in an economic expansion. Foreclosures should increase during a recession or just after a recession. If we have a recession we're in big trouble. The April index reading is almost 20% below the year-ago figure, and is 21% below the 12-month average. Worse yet for the major PC makers — including Dell, (DELL) Hewlett-Packard, (HPQ) Apple (AAPL) and Gateway (GTW) — demand among some key customer groups has plummeted. Planned PC purchases among parents sunk 32% in April from March. The purchase intent score for parents is at its lowest level since TechnoMetrica started measuring home PC purchase intent in April 2002. Also hitting new lows for PC purchase intent were households with incomes over $75,000 and people with graduate or professional degrees. These groups are more likely to buy higher-end, feature-rich PCs, which carry higher prices and profits for PC makers, Kambanis says. On a positive note, PC purchase intent among people 18 to 24 years old is at its highest level since the poll started five years ago. IBD included this article so investors could get an idea of whether or not computer makers would be an attractive long of short. However, this information also gives us an idea of consumer sentiment going forward. Retail sales are the only economic area holding the economy up. Because computers are a pricier item (with laptops still costing about $1000 per), consumer intent to purchase or not purchase these items gives us a clue for how confident consumers are going forward. The drop in this number indicates consumers may not be that confident going forward. There could be a lot of non-income based reasons for this: Vista is unproven, it's too early to purchase for the fall semester etc... However, this number could also indicate consumers are either strapped financially or at least are pulling in their spending habits a bit. For the eleventh consecutive week, gasoline prices increased, climbing 7.4 cents to 287.6 cents per gallon for the week of April 16, 2007. Prices are now 9.3 cents per gallon higher than at this time last year. All regions reported higher prices. East Coast prices were up 8.4 cents to 283.9 cents per gallon. The Midwest saw prices rise 6.3 cents to 280.7 cents per gallon. The largest regional increase was in the Gulf Coast, with prices up 8.8 cents to 276.3 cents per gallon. Rocky Mountain prices increased 8.2 cents to 280.1 cents per gallon. West Coast prices were up 5.7 cents to 319.5 cents per gallon, with the average price for regular grade in California up 5.3 cents to 330.5 cents per gallon, 40.9 cents per gallon above last year's price. This chart is from the WSJ's Marketbeat blog. Notice the large percentage of loans written last year to either subprime borrowers or second homebuyers. I'm not saying this is good or bad. What I am saying is it seems like a fair amount of mortgage loans were made to people who either had questionable credit or already had a home. The following is from an email I received that comes from an options group I belong to. The article is written by Dr. Marc Faber. First, it is important to understand that mortgage debt has begun to grow at a slower pace largely because home prices are no longer appreciating. The growth in the mortgage market was about equal to nominal GDP growth between 1980 and 2000. But, in the 2000 to 2006 period, a massive breakout from the trend occurred and, combined with a decline in the saving rate, drove consumption and GDP growth. But, as home prices began to decline in 2006, and as problems in the subprime lending market became evident, lending standards were tightened to their highest level in 15 years. Declining home prices and tighter lending standards brought about a slowdown not only in mortgage debt growth but also in overall debt growth. Mortgage debt, which grew at an annual rate of 10.2% in the second quarter of 2006, declined to an annual growth rate of 8.6% in the third quarter and to 6.4% in the fourth quarter. It is likely that mortgage debt growth slowed down further in the first quarter of 2007, and will decline even more in the second quarter given the problems in the sub-prime lending industry and the tight lending standards. In the meantime, household debt growth in the United States has declined from a peak of 11.9% in the third quarter of 2005 to 6.6% annual rate in the fourth quarter of 2006. According to David Rosenberg, the fourth-quarter 2006 annual credit growth was the slowest since the third quarter of 1998 and the sixth consecutive quarterly deceleration, “which hasn’t happened since 1956” (emphasis added). Now, ceteris paribus, this significant slowdown in mortgage and household debt accumulation would have already brought about a significant slowdown, or even a decline, in US consumption. However, because of the stock market rally in the fourth quarter of 2006, equity wealth increased by 4.2%, or an annual rate of 18%. Now, this deterioration in household debt growth hasn’t yet led to a consumer spending decline; but, very clearly, retail sales are now growing more slowly. Continuous consumption growth was therefore driven less by household debt growth in the fourth quarter of last year and the first quarter of this year, than by the continuation of an increase in household wealth and the selling of US equities by the household sector. But herein lies the problem. If declining home prices are now joined by equity prices that are either declining or no longer rising, it will only be a matter of time before consumer confidence declines and the consumer either slows down their spending further or stops spending altogether. Let's look at two strands of thought Dr. Faber puts together. The growth in the mortgage market was about equal to nominal GDP growth between 1980 and 2000. But, in the 2000 to 2006 period, a massive breakout from the trend occurred and, combined with a decline in the saving rate, drove consumption and GDP growth. Notice the mammoth jump over the last five years. This indicates that record low interest rates were a prime driver of consumption. Continuous consumption growth was therefore driven less by household debt growth in the fourth quarter of last year and the first quarter of this year, than by the continuation of an increase in household wealth and the selling of US equities by the household sector. According to the Federal Reserves Flow of Funds Report total household positions in equities increased from $14.829 trillion in 2005 to $16.275 in 2006. In other words, Faber is arguing (and I believe correctly) that the equity markets are responsible for the latest cash infusion into consumers pocketbooks and therefore their spending habits. If this thesis proves correct, then a sustained decline in equity prices will be the driver of declining retail sales and personal consumption. I would add that as long as job and income growth remain at current levels, they may provide a mitigating factor to the above mentioned downturn. - Consume energy in any way, shape or form. For those of you who raised your hands, put them down because you're lying. There was a lot of talk about the tame CPI number yesterday. That's all well and good, but the last time I checked everybody eats food and uses energy in one form or another. That means the total CPI number is the most relevant to all consumers. Of the six banks that reported earnings yesterday, four -- SunTrust, U.S. Bancorp, Comerica Inc. and M&T Bank Corp. -- saw net income fall from the year-ago quarter. KeyCorp, of Cleveland, posted a 31% gain in quarterly profit, helped by the sale of its McDonald Investments unit. Wells Fargo cited higher losses on home-equity loans in the Midwest and in central California. Howard Atkins, Wells's chief financial officer, said deterioration in certain markets was caused by rising interest rates on some mortgages combined with falling home prices, creating very high loan-to-value ratios that made it difficult for borrowers to refinance out of high-cost loans. Minneapolis-based U.S. Bancorp said net income fell 2% from a year ago, citing higher credit costs and operating costs of acquired businesses and lower net-interest income, which offset growth in fees. SunTrust saw net income fall 2%. While revenue grew 1% and outpaced growth in expenses, it wasn't enough to overcome an increase in the provision for loan losses. SunTrust said nonperforming loans rose to 0.57% of total loans from 0.25% a year ago, largely due to slipping credit quality on low-documentation, or "Alternative A," loans. Detroit-based Comerica said net income fell 2%, despite a tight rein on expenses, due to a higher loan-loss provision. M&T Bank, based in Buffalo, said profit fell 13% due to previously disclosed declines in mortgage revenue. The bank said buyers of Alternative A loans are getting scarce, forcing M&T to keep more loans on its books. 1.) Banks tighten their lending standards. There is already tightening going on in the subprime market. Don't be surprised to see this trend extend to other, better quality loans. 2.) Expect banks to begin slipping loan loss provision increases into statements. They will try to minimize the effect of these statements, so you have to keep an eye out for the odd announcement here and there. 3.) Expect to hear more stories about people with exotic mortgages having trouble refinancing. 4.) Foreclosures are already increasing. This is the end result of all this news. As banks tighten their credit standards, people with problems loans will be less able to refinance their loans. This will more than likely lead to an increase in foreclosures. The numbers were in line with expectations. But IBM's comments that it saw an unexpected U.S. sales slowdown in March caused analysts in the company's conference call to probe for hints about whether business spending is slowing broadly, with implications for the overall economy. "Everything was going great until they started talking about weakness in U.S. enterprise spending, especially in financial and telecom which are economically sensitive," said Chris Whitmore, an analyst with Deutsche Bank. "It created a lot of concerns about that big-spending group." Mr. Whitmore noted that storage giant EMC Corp. also cited U.S. revenue weakness in reporting earnings yesterday. While this is just anecdotal evidence, IBM had $91 billion in revenues in 2006. That means paying attention to what they say might be a good idea. Housing starts in the U.S. unexpectedly rose for a second month in March, bolstering expectations the worst housing slump in 15 years may be easing. Builders broke ground on new homes at an annual rate of 1.518 million last month, an increase of 0.8 percent from February, the Commerce Department said today in Washington. Building permits, a sign of future construction, also rose 0.8 percent. Unusually warm temperatures last month encouraged builders to start work on more homes, along with signs that demand is starting to firm as prices moderate. The Federal Reserve predicts the economy will pick up in the course of the year as the drag from housing diminishes, while warning that a wave of mortgage defaults poses a risk to their forecast. Let's coordinate this report with a few other data points. The National Association of Home Builders/Wells Fargo index of sentiment fell to 33 from 36 in March, the Washington-based association said today. A reading below 50 means most respondents view conditions as poor. 2.) There is already an 8.1 month supply of new homes on the market. This number has increased from 6.1 months in December 2006. According to the same report, the actual number of new homes on the market has increased 1% over the last year, from 538,000 to 546,000. Is this really the time to be increasing inventory? Overall consumer price inflation has come down since last year, primarily as a result of the deceleration of consumers’ energy costs. Problem: Oil prices are increasing. They are in an uptrend and have broken through resistance. The consumer price index (CPI) increased 2.4 percent over the twelve months ending in February, down from 3.6 percent a year earlier. Problem: That number is now 2.7% according to the latest CPI news. Another measure of core inflation that we monitor closely, based on the price index for personal consumption expenditures excluding food and energy, shows a similar pattern. It looks as though Bernanke's ideal situation -- the economy naturally slowing inflation for the Fed -- isn't going to happen. A measure of prices paid by U.S. consumers rose less than forecast last month, supporting the Federal Reserve's call that inflation will subside as the economy slows. The 0.1 percent increase in core consumer prices, which exclude food and energy costs, was the smallest this year and follows a 0.2 percent February gain, the Labor Department said today in Washington. Prices overall rose 0.6 percent in March, led by a jump in fuel costs. Less inflation may give Fed Chairman Ben S. Bernanke and his colleagues more latitude to lower interest rates to reinvigorate the economy in coming months, economists said. Cheaper clothing and hotel stays and a smaller gain in medical care costs restrained price gains last month, suggesting a slowing economy is starting to help alleviate price pressures. rate in nearly a year during March, though so-called core prices that exclude food and energy items rose at a muted pace, the Labor Department said on Tuesday. The Consumer Price Index climbed at a 0.6 percent rate, up from 0.4 percent in February. It was the largest monthly increase since a matching 0.6 percent rise last April. A 10.6 percent jump in gasoline prices last month eclipsed a 0.3 percent gain in February and was the largest increase in 1-1/2 years since a 17.4 percent gain in September 2005. The Consumer Price Index for All Urban Consumers (CPI-U) increased 0.9 percent in March, before seasonal adjustment, the Bureau of Labor Statistics of the U.S. Department of Labor reported today. The March level of 205.352 (1982-84=100) was 2.8 percent higher than in March 2006. For the first three months of 2007, consumer prices increased at a seasonally adjusted annual rate (SAAR) of 4.7 percent. This compares with an increase of 2.5 percent for all of 2006. Let's cut through all of this static. 1.) Everybody talks about the core rate, but almost no one explains why the Federal Reserve looks at the core rate. The Fed looks at the core rate to see if the more volatile price components of CPI (food and energy prices) are bleeding through to other areas prices. If core CPI is tame, it usually means the more volatile prices are not impacting other prices. This is what has given the Federal reserve the confidence to continually state price pressures should subside over time. 2.) All that being said, outside of this policy perspective, the core rate is practically useless. Everybody consumes gas and food so the overall rate is what is important from an individual's perspective. And this number is not good. It indicates prices are increasing at an uncomfortable rate. 3.) Notice the year-over-year number increased 2.8%. That is .8% above the Fed's preferred level of 1%-2%. Translation: the Fed isn't lowering rates anytime soon (barring clear signs the economy is tanking hard). 4.) There are some very scary 3-month compound growth rate numbers in this report. Food: +7.4%, Transportation, +8.3%, Energy +22.9%, Medical Care +5.6%. Short version: this report further solidifies my conviction that the Fed is on the sidelines for the foreseeable future, barring evidence the economy is tanking hard. The government sharply raised its estimate of February retail sales, saying they rose 0.5%, instead of the previously reported 0.1%. "It was a decent report, especially when you take into account the revisions," said Haseeb Ahmed an economist with J.P. Morgan Chase & Co. "It basically points to a consumer that is doing OK."
The latest numbers on consumer spending indicate that personal-consumption expenditures are growing at a rate of about 3%, slower than the 4.8% rate recorded in the first quarter of 2006. Consumer spending, which accounts for about 70% of U.S. economic activity, has taken on greater importance in recent months because it is one of the economy's few remaining areas of strength. The decline in housing construction has taken a huge bite out of the economy over the past year and rising foreclosures are also expected to hurt economic growth. Here are two charts from the Wall Street Journal. Let's look at them in a bit more detail. I have drawn a fairly arbitrary line on this graph of retail sales that separates two growth trends. Section A has a strong upward movement and is a very strong trend. While section B is also moving upwards, notice the slope is less steep, indicating growth is weakening a bit. The last few months could be a slight reprieve from the downtrend or the start of a new uptrend. We won't for a few months. What's keeping consumer spending going is employment and wage growth. "Consumers may not be happy with high energy prices right now, or weakness in the housing market. But as long as the job situation is still really good they have the income to spend and they're spending it," said Gary Thayer, chief economist at A.G. Edwards. The job market is a lagging indicator. And this chart indicates employers act quickly when trouble emerges. An index of U.S. homebuilders' confidence fell to the lowest level of the year this month amid concern that an increase in mortgage defaults is resulting in tighter lending standards that are discouraging would-be buyers. According to today's report, single-family home sales have fallen this month and builders' outlooks for the next six months are at the lowest level since October. That, along with rising defaults on subprime mortgages and excess inventory levels, suggests a greater drag on construction this year. Of course -- housing has bottomed, right? Seriously, I think this is a very important number because these are people who are familiar with the market -- intimately familiar. Most importantly, as CEOs they are paid to put on a solid public face. When they are actually saying things aren't that good it's very important to listen. I exaggerated the 1-year charts of the SPYs, QQQQs and IWNs to highlight the volume of the post-China rally. Notice how the volume's 20-day EMA has been decreasing for the duration of the rally. While this is usually a bearish sign, keep in mind volume levels are coming down from high levels from the China sell-off. The U.S. Census Bureau announced today that advance estimates of U.S. retail and food services sales for March, adjusted for seasonal variation and holiday and trading-day differences, but not for price changes, were $371.6 billion, an increase of 0.7 percent (±0.7%)* from the previous month and up 3.8 percent (±0.7%) from March 2006. Total sales for the January through March 2007 period were up 3.2 percent (±0.5%) from the same period a year ago. The January 2007 to February 2007 percent change was revised from 0.1 percent (± 0.7%)* to 0.5 percent (± 0.2%). Retail trade sales were up 0.6 percent (±0.7%)* from February 2007 and were 3.6 percent (±0.8%) above last year. Clothing and clothing accessories stores were up 8.0 percent (±1.5%) from March 2006 and sales of general merchandise stores were up 5.8 percent (±0.2%) from last year. Let's look at the numbers in a bit more detail. 1.) These are preliminary numbers; they could be restated in the future. 2.) The only area to see a decrease was electronics and appliance stores, which decreased 1.9%. 3.) Building materials/supplies increased 1.4%. My guess is this is a spring cleaning/repairing increase. Also note that sales dropped .2% in the February from January category, implying some of this months increase might be a make-up from the lost sales. 4.) Gas stations saw a 3.1% increase. I'm not sure how much of this is due to the increasing cost of gasoline, but I would guess that plays a part. 5.) All other categories look at worst pretty good. In short, this is a good report for the market. Personal income increased $65.4 billion, or 0.6 percent, and disposable personal income (DPI) increased $53.8 billion, or 0.5 percent, in February, according to the Bureau of Economic Analysis. Personal consumption expenditures (PCE) increased $55.5 billion, or 0.6 percent. In January, personal income increased $110.5 billion, or 1.0 percent, DPI increased $74.2 billion, or 0.8 percent, and PCE increased $50.2 billion, or 0.5 percent, based on revised estimates. Truckload carrier US Xpress Enterprises Inc. said it would likely post a loss in the first quarter, which compares with a profit last year, citing lower-than-expected freight demand, severe winter weather and rising fuel prices. The news was not entirely unexpected, as the company usually experiences a rough start to the year and carriers throughout the sector have complained of similar headwinds. The sector also witnessed a downgrade of J.B. Hunt Transport Services Inc. by Edward Wolfe at Bear Stearns, who took the stock to "Peer Perform" from "Outperform," due mostly to the 37 percent it has gained since the start of the year. Dow theory relies on confirmation of a move by at least two averages. The theory is simple. If business is really doing well, then they will have to ship their goods to market. This in turn is good for transportation companies. However, the above news is not good for transportation companies. We'll have to see how this news plays out in the big scheme, but for now consider it food for thought. Americans face sizable increases in their grocery bills this year as a boom in ethanol production diverts more corn from the nation's dinner table to its gas tank. Indeed, their pocketbooks could feel the pinch for years to come. High corn prices, bad weather and steep energy costs have combined to make food a bigger potential contributor to inflation this year than it has been at least since 2004, when a cutback in dairy production boosted dairy prices and beef prices rose as mad-cow disease disrupted trade. The Agriculture Department says that retail food prices are likely to climb by 2.5% to 3.5% in 2007, fueled in part by strong demand for corn-derived ethanol. But Michael Swanson, an agricultural economist at Wells Fargo & Co., thinks the rise could be an even sharper 4.5%. 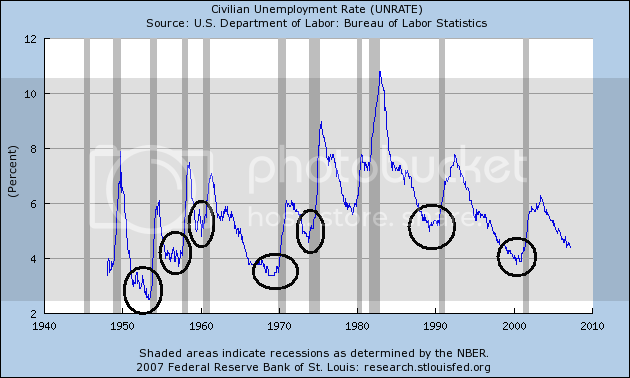 One of the main arguments against the recessionary forecasts is the low unemployment rate. The chart below illustrates a few points about that argument. 1.) The unemployment rate is always very low just before a recession. 2.) The unemployment rate typically moves up pretty strongly after the recession starts as employers stop hiring pretty quickly. In other words, the tide changes very quickly. Corporate balance sheets, by almost any standard, couldn't be in much better shape than they are right now. If anything, you could make the case that corporate balance sheets aren't leveraged enough. There is too much cash on the balance sheet, there is not enough debt. It is hard to get a recession when corporate balance sheets are this clean. No. 2, employment is generally a lagging indicator, but the employment situation is so good. The unemployment rate is 4½%. When I got out of college, full employment was considered 5½% to 6%. It is hard to get a recession when both corporate and consumer balance sheets are as strong as they are and when people are employed. These are both very solid points. According to the Federal Reserve's Flow of Funds Report, nonfarm, nonfinancial corporate business has a very clean balance sheet. Assets are over twice the amount of liabilities and there is plenty of cash on the books. This is one of the main reasons for the large amount of corporate stock buy-backs in the the market right now. In addition, corporations are the only economic sector actually saving any money right now. As for employment, I'm a bit more sanguine. Two months ago, construction shed 63,000 jobs. Most of these were replaced last month, but I have to wonder how often we will see this type of pattern. In addition, last months employment report showed a net loss of service sector jobs. This is an economic area that has provided strong growth for the duration of this expansion. However, my gripes with employment are two nicks in the picture. We have yet to see a sustained loss of jobs. Instead, we have seen nicks and cuts in the overall landscape. With the Fed on hold, banks' net interest margins continue to come under pressure. "The dramatic loan growth banks have enjoyed also will slow, especially in consumer- or mortgage-related segments," Bagley says. Another direct hit to earnings could come from the greater reserves banks set aside for rising defaults or credit deterioration. While big banks with thriving investment-%banking operations might hold up well, smaller regional lenders will have a harder time. The KBW Bank Index has slipped 4% since March 21 even as the market advanced, as inflation stayed firmer than investors hoped. The index fell Wednesday after minutes from a recent policy meeting showed the Federal Reserve still vexed by inflation and none too likely to begin cutting interest rates soon. The potential for economic deceleration, a worsening housing market and inflation that keeps the Fed's hands tied could prove to be a "perfect storm" for banks, says Dan Jones, who runs Blue Water Asset Management. As a hedge, he suggests buying June put spreads on the bank index. It may indeed be the case that banks will dodge any incoming bullets from the growing number of mortgage defaults, as many people argue. But evidence like this tells me that banks have a lot to lose if mortgages go bad. Here are the links to the articles.